Body Beast Results: Keith Lost 47 Pounds in Just 90 Days! Keith Lehman, age 42, lost 47 lbs. 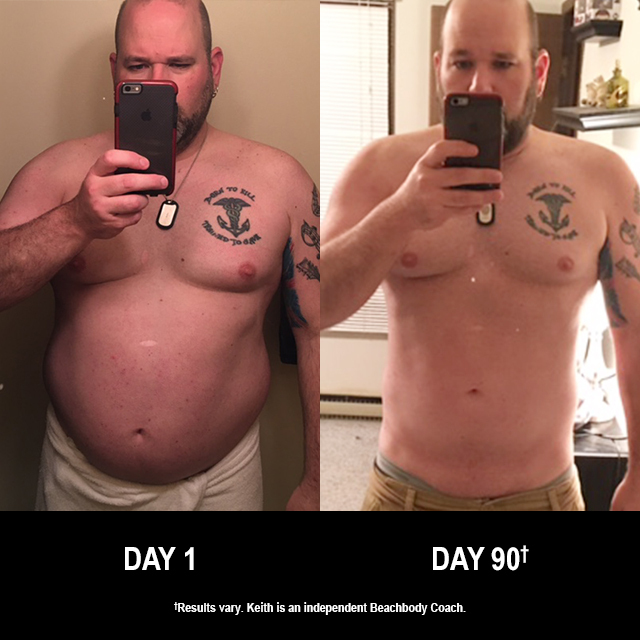 in 90 days with Body Beast and the Beachbody Performance supplements. He entered his results into the Beachbody Challenge, and won $1,500! Before beginning Body Beast, I was, to say the least, uncomfortable. I couldn’t walk out to get the mail without being out of breath. My shoes were always tied to the side, because I couldn’t bend over to tie them and had to cross my legs instead. I was lethargic and, to be honest, had given up. I simply laid in my recliner and waited for each day to pass. I was slowly killing myself and I didn’t care. Only a few weeks into Body Beast, I began to see a difference. Not only had my body begun to change, but the mental image of myself as well. I couldn’t wait to share my results with everyone I knew! I am so much more outgoing and absolutely despise sitting at home. My energy level has increased dramatically, and I feel as though there are no limits to what I may do next. To put it plain and simple, I enjoy living again. I can’t give credit to one thing that inspired me to begin my journey, but several. A year and a half ago, I lost my twin brother to a heart attack. In that moment, I allowed my life to end with his. I stopped moving, and every day, every pain signified another symptom of my passing. Nothing mattered. I had accepted his fate as my own and was just ready to give up on life. A random message to a girl I had never met changed my outlook. We began talking and became close friends. At some point, she decided to become a Beachbody Coach. As her friend, I supported her and told her I would help in anyway I could. She convinced me to begin moving and, quite simply, that my life was not over and I was worthy of saving. So I began fighting. It was no longer about feeling sorry for myself; it was about survival. The greatest challenge for me was the first step. Once I began moving, I did not want to stop. I went to the gym, but had no clue what I should do when I got there. I would spend 30 minutes on the elliptical and maybe a few curls, but that was it; I was lost. I saw the Body Beast infomercial and realized I didn’t need a trainer. I received the DVDs on my 42nd birthday. I watched them and wrote down the exercises, the sets, and the repetitions. I took my notebook to the gym and looked like a pro! The Body Beast program not only showed me the proper routine, but gave me the confidence to do them. I liked the program because it made it simple to understand the routines. I did not have to go to the gym, but knew in order for me to be successful, I had to leave the house. My results are remarkable. I’ve lost nearly 50 lbs. and dropped three pant sizes. I have put on muscle, and I am actually beginning to see abs! I’m not ashamed of my body; in fact, I show it off to everyone. I have posted pictures of myself on Facebook in hopes of inspiring others to do the same. My confidence is through the roof with energy levels to match. My life has changed because people look at me differently. But more importantly, I look at myself differently. No longer am I knocking on death’s door, but I’m inspiring others to make a difference. I’ve participated in a few clean-eating groups. They supported my healthy eating habits and shared their success. My Coach is a constant voice in my head. Her transformation and support has been nothing less than inspiring. She has kept me honest with myself and true to my journey. She is always there to lend a helpful hint or a much-needed voice of reason and motivation. She convinced me my life was worth it. I am so grateful for her, and I could never express how much she means to me. 2These statements have not been evaluated by the Food and Drug Administration. This product is not intended to diagnose, treat, cure, or prevent any disease.